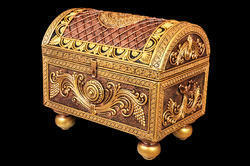 Our product range includes a wide range of big jewellery box, medium jewelry box and small jwellery box. Hand Crafted Big Jewllery Box Ceramic Crush Material with Wooden Base, Fine Hand Crafted Artwork, Washable Material with Natural Deco Paint finish. Looking for Jwellery Box ?